Today Apple released a new model in their line of iMac computers. The new model slots in below the original entry model 21.5" iMac with less powerful specifications but also a smaller price tag. With Apple's Mac Mini not having been updated since 2012, the new 21.5" iMac is a new way to access Apple's desktop ecosystem at a lower price than Apple's more powerful solutions without having to go with an older Sandy Bridge based hardware platform. Below the new 21.5" iMac is compared to the previous entry level model which still remains priced at $1299, as well as the upgraded 21.5" model in the iMac line. 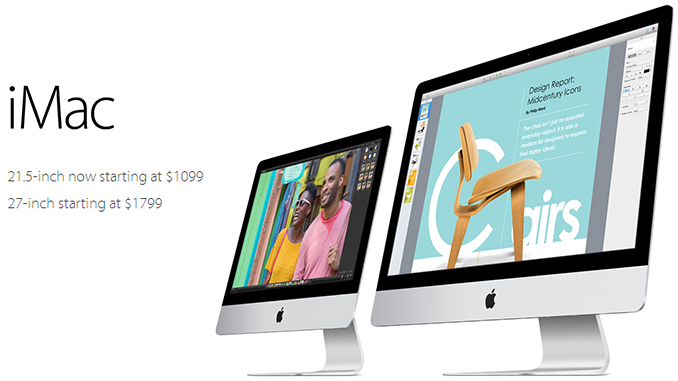 The most immediately noticeable change with the new entry level iMac is the CPU. Apple has moved from the quad core i5-4570R used in the $1299 iMac which originally served as the entry level model to the dual core i5-4260U. This is the same CPU used in Apple's 13" Macbook Air and so users can expect a similar experience regarding performance, although the iMac is likely to be able to sustain turbo clock speeds for longer periods of time due to it being less thermally constrained than the Macbook Air. Single threaded performance should be pretty decent given the 4260U's ability to turbo up to 2.7GHz. Remember that these are roughly the same individual cores that are used in the higher end iMacs - there are just fewer of them. With the move to a Haswell ULT part there is also a sacrifice in GPU performance with the new iMac running Intel's HD 5000 integrated graphics rather than the Iris Pro 5200 used in what is now the mid-range iMac model. When we looked at HD 5000 performance in the MacBook Air we determined that the performance gains from moving to Haswell GT3 in a 15W part were limited by thermals. I suspect the iMac's chassis may allow the ULT part to stretch its graphics performance a bit more. With the mid-range iMac sporting a quad core i5 and Iris Pro graphics the CPU is likely going to be the deciding point for users choosing between the new entry level iMac and the mid-range model. In addition to the CPU changes, the hard drive sees a drop in capacity from 1TB to 500GB compared to the previous entry level model. Aside from the changes to the CPU and the hard drive the new entry level iMac retains all the other hardware that ships in the other 21.5" iMac models. It still includes the 1920x1080 IPS display which was found to perform quite favorably, 8GB of RAM, and all the I/O connectors including four USB 3.0 ports, two Thunderbolt ports, 1 gigabit ethernet port, an SDXC reader, and a 3.5mm headphone jack. Looking at the new iMac, it seems like a product that has the business and education market in mind. Users who intend to do anything performance intensive are much better served by the mid-range model. But in an office environment or in schools the performance reductions may not be much of a concern when the computers are needed for simple web browsing and working with documents. For those markets the $200 savings on each computer will be quite significant when ordering in large amounts. This is about as low for specs as they can get for Apple. Old & slow notebook processor + old & slow notebook hard drive + notebook ram. This is lowest price laptop material (which usually don't go *above* $500), priced at $1000 starting! LOL. Parts cost here is probably $150 aside from the screen. It's a MSRP for a product sold exclusively to OEM, I trust it as much as MSRP on clothing. LOL yet another advertisement run for Apple by Anandtech. 20 bucks says this "article" was pre screened by an Apple rep.
People in internet land…. examine the BIAS in every article you read nowadays.. the internet is quickly becoming one giant commercial....don't let sites like AnandTech make you a fool. "the new 21.5" iMac is a new way to access Apple's desktop ecosystem at a lower price than Apple's more powerful solutions without having to go with an older Sandy Bridge based hardware platform"
"It still includes the 1920x1080 IPS display which was found to perform quite favorably,"
WILL ABSOLUTELY SMOKE the "new" 1099 imac in every department except wifi and maybe a few fps in graphics. Everything else will be a benchmark and real world performance SLAUGHTER in favour of the mini. I mean not not even close…. in productivity, encoding or even web browsing for that matter. the 2.6 mac mini quad core is still one of the highest performing systems apple ever built… with the exception of grpahics…. but anyone purchasing a budget system is not concerned with gaming FPS. The pricing for the old mini leaves 300 or MORE for DUAL 24" 1080p or GREATER monitors that can follow you to your next system upgrade...whereas the iMac display will need to be repurchased. “Apple didn't upgrade the non retina 1080p display, replaced the internals with the cheapest hardware they had on hand and then slapped an 1100 dollar price tag on it. That said, we here at AnandTech think you should buy this new product because we own a lot of Apple stock." It's a new product from a prominent tech company. They're not spending 50 pages on it for crying out loud. The new low end iMac is actually a very interesting move by Apple, because it marks the first time they have ever used a mobile CPU instead of a desktop one in an iMac. This required a new logic board layout due to the move to a single FCBGA multi-chip package for the CPU and PCH, and soldered LPDDR3 DRAM instead of SODIMM slots. I can only imagine that this will not be a one-off, and we can expect more of the same when the Broadwell based iMacs are unveiled. • a rather well calibrated, 21.5-inch, 1920x1080, IPS display with bonded cover glass. The $599 mini (of which the latest iterations are actually IVB, not SNB as stated in the original post) has a slightly faster i5-3210M CPU, slower HD 4000 graphics, only 4 GB of DDR3 SDRAM, a single Thunderbolt / miniDP++ port, gains a FireWire 800 port, lacks ac Wi-Fi, only has one dinky little speaker, has an IR receiver, yet comes with no webcam, microphone, display, keyboard or mouse. And although the mini has lower idle power consumption, it actually draws more at max load without a display than the new low-end iMac does. If you wanted to add back in all the features of the iMac which the mini leaves out, you'd end up spending just as much if not more, and you sure as heck wouldn't end up with an all-in-one that can be pulled out of the box and plugged in via a single cable. Also note that the $1099 iMac has 1 TB HDD, 1 TB HDD + 128 GB PCIe SSD (Fusion Drive), and 256 GB PCIe SSD storage options for an additional $50 - $250. While you could potentially roll your own upgrade with the mini for perhaps a little bit less money, you'll never manage to achieve the same performance as those PCIe 2.0 x2 SSD modules provide. For that price, you should get a 2GB 850M or 775M, SSD + 2TB drive, and an i7.